The Daughters of Penelope (DOP) Altes Chapter 163 started in October 1947 with a mere 19 members. Fast forward 71 years, and the Chapter is thriving with more than 100 members, as it continues promoting Hellenism, philanthropy, civic responsibility, bringing family and individual excellence to life. Over the years they have worked together on numerous projects and given funds to a plethora of organizations and persons in need. 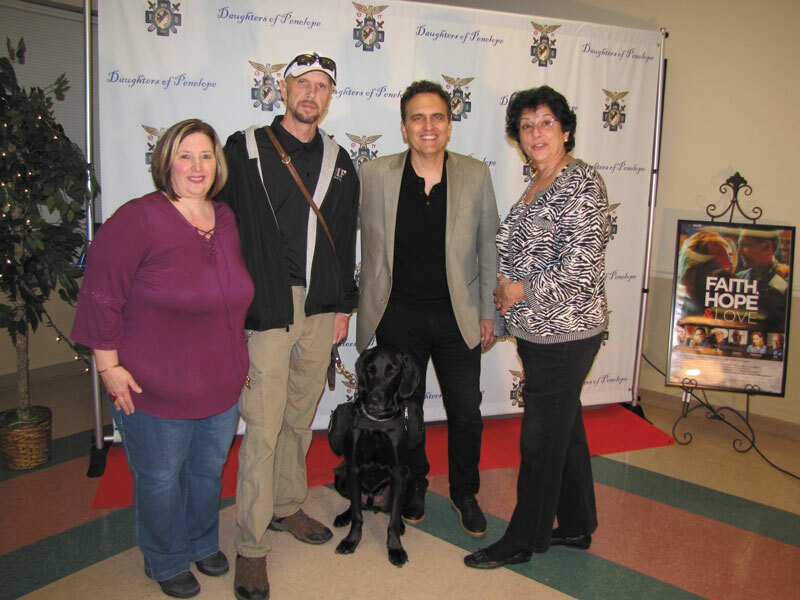 Most recently, it added the AHEPA Service Dogs for Warriors Program as an endeavor close to its heart. The nationwide AHEPA Service Dogs for Warriors Program is an offspring of a project started by George Karatzia, himself a Vietnam veteran. 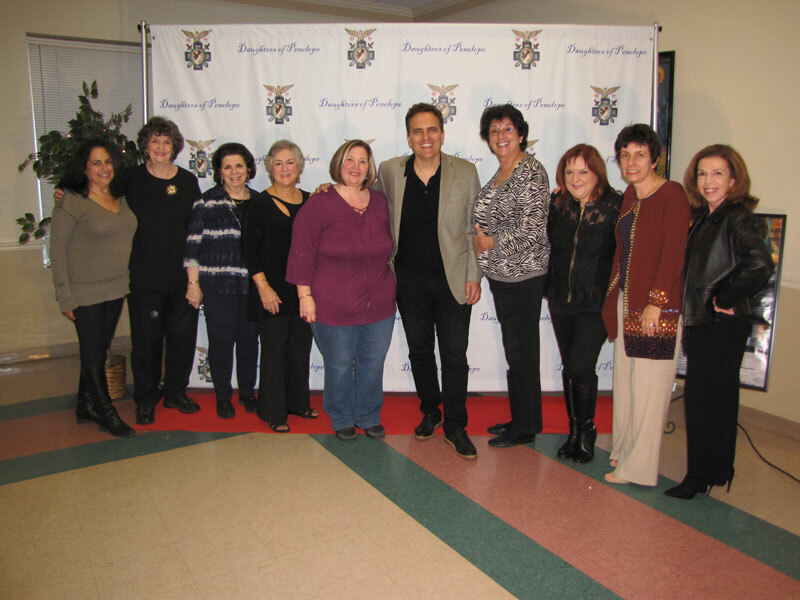 Familiar with the struggles of being a veteran, he started the project in 2015 at his local AHEPA chapter AHEPA Garden State Chapter 517. 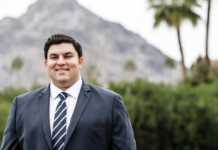 The work and benefits of his program inspired the AHEPA national convention to adopt the AHEPA Service Dog’s for Warriors Program as a national project in 2016. 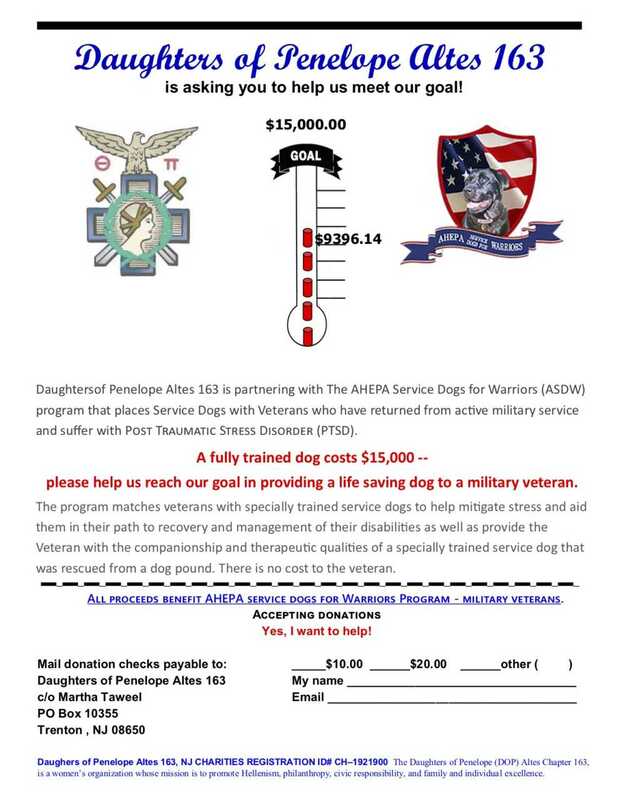 The AHEPA organization has partnered with K9’s for Warriors in Florida, which finds and trains the dogs and places them with veterans. Any veteran who had been on active combat duty since 9/11, and has been diagnosed with PTSD post-engagement is eligible to apply. The dogs, many coming from shelters, go through a rigorous 10-month program that includes extensive training to learn the signs of a PTSD occurrence and how to prevent a full-blown PTSD crisis. 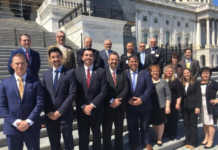 DOP Altes 163 became aware of the initiative when Rick Roscoe, president of AHEPA Chapter 72 in Trenton, learned of the program and was so inspired he made it a mission of his tenure to purchase a dog. Through hard work and determination, his Chapter was able to purchase a service dog. Members of DOP Altes 163 heard the call for action, and they’ve rallied together to organize fundraisers so that they, too, could purchase a much-needed service dog. 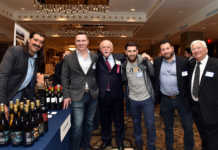 Their hard work started in April 2018 with Humor for Warriors 1; followed by a Movie Night Fundraiser in October 2018. They are now busy working on a third fundraising event. On March 8, 2019, Humor for Warriors 2 will take place. To date, they have raised over $9,000 through fundraising. They remain enthusiastically optimistic that the remaining funds needed to reach the $15,000 purchase and training price of a single dog will be achieved. When asked why she considered the Service Dogs for Warriors Program one of the Chapter’s most important initiatives, Sondi Huber, president Altes 163, response was quick. “It is plain and simple: these dogs are a genuine gift of life to a veteran and an opportunity for us to give back to someone who has given so much for our country”. Martha Taweel, an event committee member, shares, “If you have ever met one of the veterans and their service dog, you’d understand why words often can’t express what it means to be able to provide a veteran with one of these specially-trained dogs”. Come help Altes 163 reach their goal of raising $15,000. 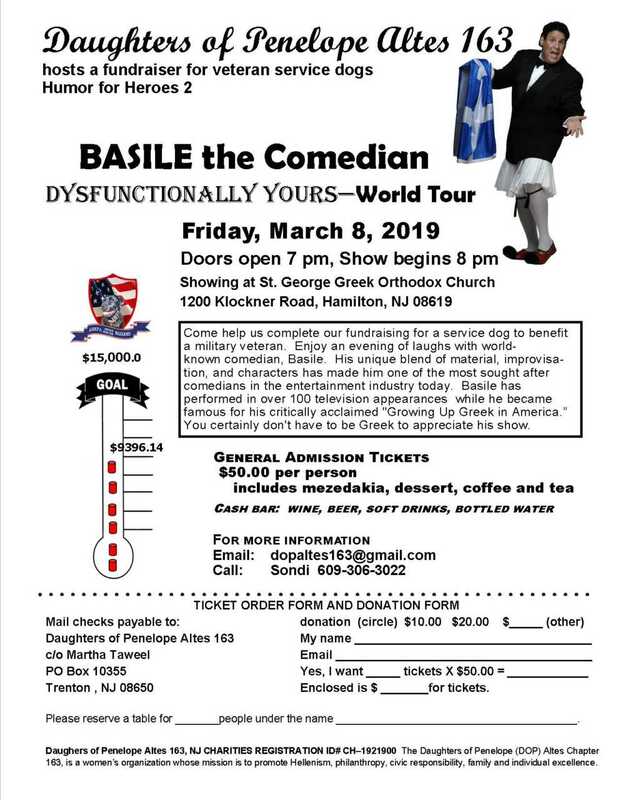 On March 8, 2019, join them for Humor for Hero’s 2, an evening of laughs as they host Basile the Comedian – Dysfunctionally Yours – World Tour. Basile’s unique blend of material, improvisation and characters has made him a sought-after comedian sure to bring laughter and smiles. General admission tickets are $50 per person, including mezedakia, dessert, coffee and tea. A cash bar and beverages will be available. Reserve your seats now and mail your checks payable to Daughters of Penelope Altes 163, c\o Martha Taweel, P.O. Box 10355, Trenton, NJ 08650. 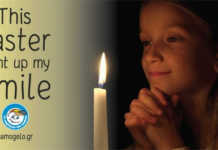 General donations, too, will be accepted. Η Μέγας Γύρος ενισχύει το εκπαιδευτικό της όραμα!